NEW YORK -- Rangers coach John Tortorella talked to his team about Chris Kreider before the 20-year-old college star arrived in town from Boston with the ink barely dry on his entry-level contract. Tortorella wanted to make sure everyone in the dressing room understood what Kreider might be feeling and how strange and difficult of a situation it was for him to be walking into. "It's a hard situation for a kid," Tortorella said. Three weeks later, Kreider is making everything look easy, his teammates absolutely love him, and the 18,200 blue-clad fans at Madison Square Garden are chanting his name. Kreider scored his second game-winning goal of the playoffs and added an assist to help the Rangers to a 3-1 win over Washington on Saturday in Game 1 of the Eastern Conference Semifinals. He used a burst of speed in the neutral zone to get a step on Capitals defenseman Roman Hamrlik, took a head-man pass from Derek Stepan just before reaching the blue line -- and with Mike Green closing in, blasted a shot past Braden Holtby from the top of the left circle to give the Rangers a 2-1 lead seven minutes into the third period. Ninety seconds later, Kreider delivered a backhanded pass off the half wall to Brad Richards, who skated in alone and beat Holtby from the left post. "I was kind of gassed, at the end of the shift, and usually I take that to the net, but I pulled up," Kreider said in describing his goal. "I don't usually take slap shots, so that was a little unorthodox for me. I saw an opening so I just tried to hit it." Kreider also scored the game-winner in Game 6 at Ottawa to help push the Eastern Conference Quarterfinal-round series back to New York for Game 7. Prior to that Game 7 on Thursday, Tortorella said he had no fear in using Kreider in all situations. Kreider went out in that pivotal Game 7 and made a crucial play at the blue line to lead to a goal. He came across the blue line and swiped the puck away from Senators forward Nick Foligno, starting the play that led to Marc Staal's goal early in the second period. "Honestly I didn't know much about him," Rangers defenseman Dan Girardi said. "I knew Steps (Stepan) and Mac (Ryan McDonagh) knew a few things about him, but I didn't know he was built like a Mack truck and could skate like the wind. We're pretty happy to have him on our team right now." That Kreider has fit right in to the Rangers is almost as amazing as his production and confidence through the first six games of his NHL career. Girardi said he might have been tentative at first, probably because he didn't want to upset anybody or do the wrong thing, but now he's just part of the team. "He's got a good attitude, he's a good person and I think our group is an amazing group," Richards said. "We have that type of mentality and closeness where we don't mind getting help, and getting a young kid that we know is going to be here for a long time. That's why it's such a good locker room." McDonagh said Kreider is always asking questions when he's on the bench. "I'm a curious kid, I guess," Kreider responded. Actually, what's curious is how the moment has not affected Kreider at all. He won the Frozen Four with Boston College exactly three weeks ago. "It's hard to believe that was only three weeks ago," Kreider said with a smile. Shortly after winning the title, Kreider signed his entry-level contract. He said he was just excited to get to New York because of the opportunity to skate with the Rangers, who were just starting a playoff journey after finishing first in the Eastern Conference with 109 points. "They made it clear that nothing was promised coming in, I had to work for whatever I got," Kreider said. "My entire life that's how I've made hockey-based decisions, where I was going to go to high school, where I was going to go to college. I didn't want things handed to me. That's not how it should be. I was really excited about how the environment was set up from the get go." 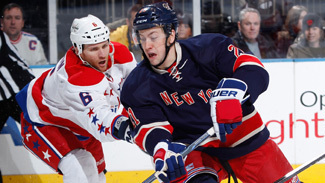 He got his chance in Game 3 against Ottawa because of Carl Hagelin's three-game suspension. Kreider played more than 11 minutes in his NHL debut, but didn't do much playing while playing Marian Gaborik and Richards. He played just a combined 11 minutes in Games 4 and 5 before making the most of his opportunity on a line with Stepan and Ryan Callahan in Game 6. Kreider's ice time went up to 18:21 in Game 7. He got 15:35 of ice time in Game 1 against the Capitals. "All the players, they dictate their own ice time (with) how they play," Tortorella said. "What he's getting he deserves." That includes the media attention, which Kreider said is the only thing about the start of his career that has been overwhelming. "It's just hockey," he said. "It's the same game I've played, just at a much higher level." And here Tortorella thought it would be difficult for the kid. "When you're that talented and you're pretty much a grown man already, it's easy for him to come in and play physical and skate, do the things that he did in college to make him successful as a pro now," Girardi said. "It's just amazing how he can skate, make things happen. I catch myself watching him from the bench. I don't know how someone can skate that fast and be so powerful. "We're lucky to have him in our lineup."